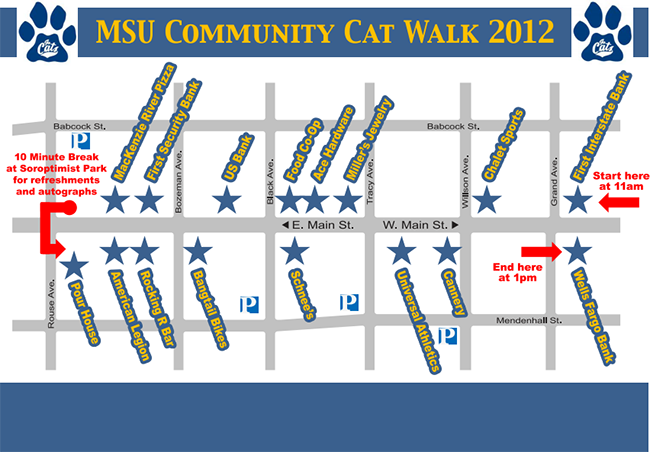 Montana State University and the Downtown Bozeman Partnership will host the third annual Cat Walk Friday, Aug. 24, from 11 a.m. to 1 p.m. on Main Street in downtown Bozeman. MSU President Waded Cruzado, Champ, the MSU Spirit of the West Marching Band, students, players and community members will make their way down Main Street to create "Bobcat Buzz" throughout the community. The group will visit businesses and stores, play the fight song and pass out Bobcat gear, treats for kids, game schedules and new 2012 window decals. The walk will begin at 11 a.m. at First Interstate Bank, located at Grand Avenue and Main Street, and move east down the south side of Main Street. It will stop into businesses along the way. Mid-way through the event, walkers will make a 10-minute stop at Soroptimist Park, located at Rouse Avenue and Main Street, for refreshments and to sign autographs. Then, walkers will head west down the north side of Main Street, again stopping into businesses. The walk will end at Wells Fargo Bank, located at Grand Avenue and Main Street, at 1p.m. Everyone is invited downtown to participate in the event, which is free and open to the public. It will take place rain or shine. For more information contact the MSU Athletic Department at 994-4221 or visit www.msubobcats.com.